Forget the pumpkin patches and trick-or-treat candy. For those of you who relish in the creepiness of Halloween, we’ve compiled a list of the spookiest spots to check out this holiday season. Consider visiting these chilling destinations right here in the U.S.
It’s not just America though, creepiness abounds worldwide. Alright. We admit we’re getting scared too. But we can’t resist posting a video of the 10 Most Haunted Places. Hopefully these scary places don’t give you nightmares! Happy Halloween! Fortunately for travelers, social media is flourishing in the travel industry. PhocusWright reports that 75% of travelers use social networks for shopping-related deals, and 30% use them particularly for travel deals. Since social media is such an important outlet for companies to pursue, they’re responding with a wide variety of social media offers for travelers. Explore the following social media options to save yourself big bucks on travel. Unbeknownst to many, Twitter has a reputation as the best social media outlet for finding travel deals. Begin by following your favorite airlines to keep up with their exclusive offers. Next, try out Twitter’s search bar, using generic hashtags like #traveldeals, #cheapflights and #cheapairfare to find general deals. You can also find deals specific to a location. For example, if you’re heading to London, try searching “Cheap London Flights,” or using The Who to Follow tab to find local London accounts. Some of the most popular travel Twitter accounts include @jetbluecheeps, which offers exclusive travel deals called “cheeps”; @wanderlisting, which advises on airlines, hotels and tips; and @airfarewatchdog and @cheapestairfare, which have the latest travel deals. You’ll find Facebook most useful for finding deals if you’re a member of a loyalty rewards program. An abundance of Facebook posts can be overwhelming, so stick to “liking” just a few companies. You may also find exclusive offers or bonuses by checking in on Facebook or Foursquare. Finally, there are number of social media travel sites. Gogobot and Trippy are designed to pull travel advice from your friends, providing you with social recommendations. You can also use Airbnb’s site to find and rent homes from people around the world. Most of the deals found on social media are quite spontaneous, often for travel within just a few hours or days. The key to scoring these deals is being quick to catch them in the small windows of time they’re available. However, as some of the offers can save you upwards of 70%, they’re definitely worth watching out for. Take advantage of this emerging trend in the travel industry to score some sweet travel deals. 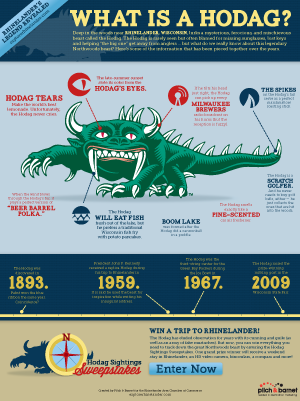 It’s tough to tell fact from legend when discussing the famed beast, so Pilch & Barnet assembled a crack team of researchers to put together the definitive picture of the Hodag. The infographic was shared to great success on Rhinelander’s Facebook page and through other social media channels, and a print piece was created for distribution. The infographic won ADDY Awards for copywriting and design. 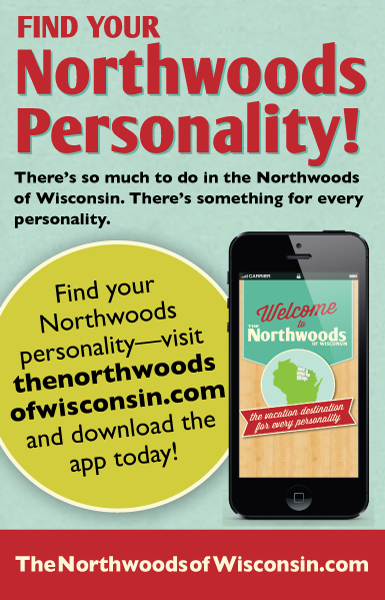 Representing a group of five counties in northern Wisconsin, Pilch & Barnet in 2012 launched a successful marketing campaign for The Northwoods of Wisconsin, including a website, mobile apps for Android and Apple and a Facebook page. “Going green” is all the rage these days, and tourism has not been isolated from the trend. It’s even got its own name: ecotourism. Start by searching for a place to stay that employs sustainable tourism practices. Travelocity has a whole directory dedicated to “green hotels”. The site will direct you to eco-friendly destinations with Energy Star approved lodging (meaning they use 40 percent less electricity and produce 35 percent less in the way of carbon emissions than a traditional hotel). And because the definition of “green” can sometimes be a little gray, Travelocity works with certification programs that go by the Global Sustainable Tourism Criteria. In order to be certified as a sustainable tourism destination, properties have to respect their cultural surroundings, use eco-friendly construction, hire locals, buy fair-trade and environmentally safe products, measure their consumption of energy and water and try to reduce it regularly and limit their noise, light and run-off pollution. But don’t just leave it up to your hotel! You can contribute to the greenness of your getaway too. Before you go, unplug your electronics, adjust your thermostat, stop your newspapers, and compost any soon- to-expire foods. Pack lightly, since the less your bag weighs, the less fuel will be needed and the less carbon dioxide emitted. Try to avoid flying by opting for a train or bus. If flying is a necessity, look for a direct flight. And once you’re there, if you need to rent a car, go for a hybrid. Or better yet, get around on foot or bike. Reuse your towels and bedding for as long as you can to save on water and energy and buy locally made souvenirs. Take a reusable water bottle and recycle wherever possible. Lastly, adhere to the golden rule of ecotourism: “Leave no trace behind,” meaning once you’re gone, no one would ever know you’d been there. Because leaving the world a little better than you found it is always a good idea. Nobody likes to travel on an empty stomach. In fact, food can be the highlight of a vacation. This week’s Link Friday is all about satisfying both your sense of adventure and your appetite. Driving while hungry can be even more aggravating than hearing, “Are we there yet?” When packing food for road trips, consider these tips and snacks. Although convenience may be ultra-appealing when you’re trying to reach your destination as quickly as possible, avoid fast-food joints and consider some healthy, on-the-road eating tips. But if you’d rather make a pit stop to satisfy your appetite, let us direct you to some great food off the interstate. Or follow this flow chart instead. For those of you who plan your vacations around great food, check out Food and Wine’s 20 Best Food Cities and Food and Travel’s Gourmet Traveller. And to avoid what airlines like to call “food,” here are goodies you can carry on the plane. Enjoy! Have a good weekend! These travel blogs and websites offer you a wide variety of travel advice. For a constant feed of tips, follow these travel Twitter accounts. Travel flawlessly on a budget, on a business trip, as a student or as a family. Every traveler can be assured R&R with advice from oprah.com’s, The Best Travel Advice We’ve Ever Heard. Now you can travel with confidence and hopefully a little spare change as well. Happy Friday!